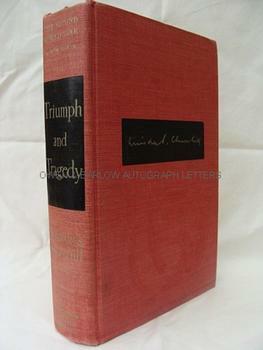 WINSTON S. CHURCHILL Triumph and Tragedy, SIGNED. British Conservative statesman. Twice Prime Minister (1940-45 and 1951-55). He was also a Nobel Prize winning writer, soldier, war correspondent and artist. 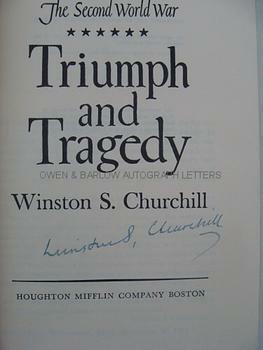 Bold autograph signature on title-page of 'Triumph and Tragedy', the 6th and concluding volume of his 'Second World War'. First U.S. Edition. Houghten Mifflin, 1953. Original red cloth, blocked black and gilt on upper cover and spine. 8vo. xvipp, 800pp. With 29 maps and diagrams (all present as called for). Spine very slightly faded and a trifle bumped at head and tail. Traces of 'cup rings' to cloth of upper board. Binding and contents are else in very clean, sound condition. Churchill was awarded the Nobel Prize for literature in 1953. His 'History of the Second World War' in 6 volumes was high amongst the works for which the prize was principally awarded.